Imagine sewing triangles quickly and easily—without measuring! WITH a line to sew along—without paper to pick off afterwards! WITH perfect results—without printing every fabric! Inklingo makes triangles simple & easy with correct straight grain, cutting and stitching lines, precision corners, and matching marks—without weird rulers, special templates, or expensive cutting machines! THIS PAGE only includes "Triangle only" PDFs. MANY MORE TRIANGLES ON OTHER PAGES Other triangles are included with diamonds, octagons, Storm At Sea, Patchwork of the Crosses, and others. The easiest way to find the size you want is to look in the Index of Shapes under the Support tab. 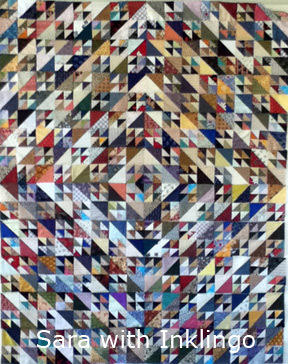 See why quilters love Inklingo triangles! From beginner to professional, we think you will love triangles too! 1. No Math! No Geometry! All Inklingo shapes are named with the finished size. You never need to add 7/8 or 1.25 to a square again. Precision corners make it easier to sew when everything lines up perfectly. It also makes it easier to cut squares and other shapes to use with the triangles, without printing. Print one fabric, layer right sides together with unprinted fabric, stitch, and cut. It's simple and accurate. Take advantage of the FREE Inklingo Shape Collection to see how easy triangles are with Inklingo. The free collection even includes the first chapter of The Inklingo Handbook, "Printing with Inklingo," so you can start printing right away. 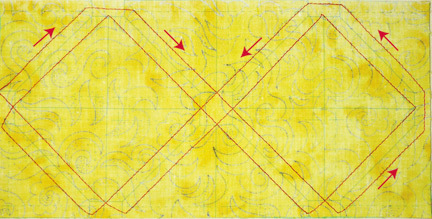 See the free Triangle Tips PDF (under the Machine Piecing tab) and The Inklingo Handbook for more. 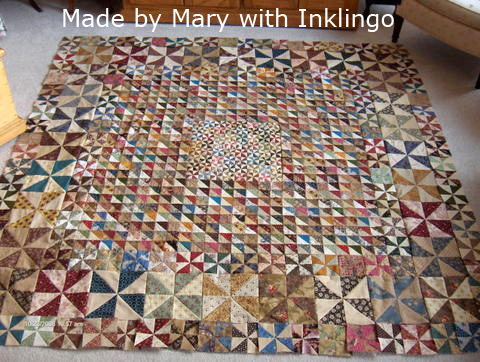 See more of Mary's Inklingo quilts on the All About Inklingo blog. 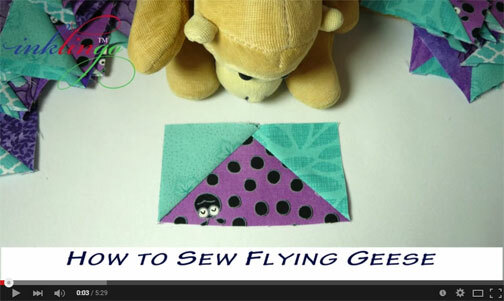 Inklingo is the easiest, most accurate way to sew Flying Geese!